The Gemini Symbol represents the third astrological sign in the Western Zodiac, originating from the constellation of Gemini. The sign of Gemini falls between the dates of May 22nd and June 21st. People born under this sign are believed to possess great charm and are very adaptable to new situations. They tend to be glib and have above average communication skills. Geminis are young at heart, possessing a natural curiosity about the world and a healthy zest for teaching and learning. They are known to be witty and spontaneous. On the down side, the spontaneous nature of Gemini is annoying to some people, as it causes them to change their minds frequently and unexpectedly. It is also believed that Geminis can sometimes be superficial or intolerant. They can also be easily overcome by nervousness. Regarding relationships, Geminis are considered compatible with Libra, Aquarius, Leo and especially other Geminis. Overwhelmingly, the most popular day in the month of June is the last day of the school year. In any year, no other month begins on the same day of the week as June does. More people get married during the month of June than during any other month of the year. The Western Zodiac signs correlating to the month of June are Gemini and Cancer. Famed events that happened in June include Ben Franklin harnessing electricity (June 15th, 1752) and the outbreak of the Korean War (June 25th, 1950), among many others. 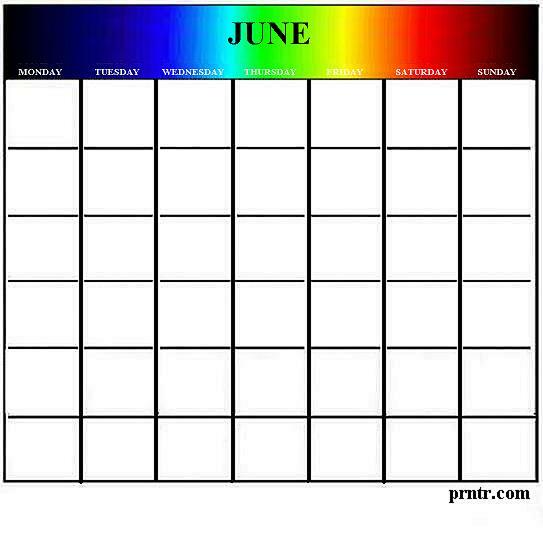 Shown above is a conveniently reusable calendar for the month of June. To print this reusable June calendar, just right-click on the image and select a SAVE option from your drop-down menu. This will SAVE the image to your picture file. From there you can reduce or enlarge it as needed for best printed results. For tattoos, clipart, a list of June holidays, and next month's calendar, visit any of the links on this page. Look here for a Free printable list of Amtrak Train Stations in All 50 States. See this page for a Free printable list of Greyhound Bus Stations in All 50 States. See Free Printable Car Insurance Stats for All 50 States and Washington DC.